Busy with RL last week and looks like this week. The Adobe updates that screwed things are not helping. The main channel is getting an update to version #18.10.25.521081. This version is apparently the same as last week’s version 18.10.19.520868, but with some fixes to the logging. That version was all Internal Changes. Posted in Cool VL, Firestorm, Second Life, Server, SLV2, 3, 4, 5, & 6 Series, Viewers. Tagged Adobe, Copyright, SANSAR. 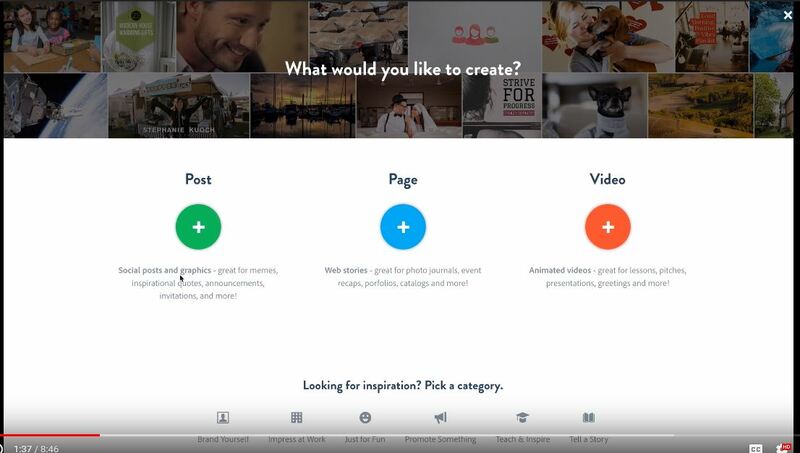 Adobe has released a new free web tool, Spark. It is an editor/creative tool for those wanting to quickly put creative things on Instagram, Flickr, YouTube, and other social media. The video shows how it is used as a video editor. From the video, this image shows that video is one of the three primary areas in which Spark is useful, Posts, Pages, and Video. Amy Landino, the video creator, points out the limits of Spark. It is not going to replace Adobe Premiere Pro. But, this is may be handy for quick little things and those that can live within the restrictions of a template driven system. Since it is all free, you may be wondering why it is free. The servers and programming all cost money. So, there must be some financial model behind what Adobe is offering. I think Adobe’s incentive is marketing for Adobe products. There are opportunities they take to promote Premiere and their other retail products. I can’t yet tell if that is the sole benefit to Adobe. But, they weren’t asking for an email address or log in during the parts I played with. YouTube already has some Spark Tutorials. So, you aren’t solely on your own. If you have ever wanted to show off your SL creations, avatar, pretty place… this is an opportunity to create with free tools from the premier maker of artistic software. Posted in Content Creation. Tagged Adobe, Tutorials. This is the newest version of Photoshop as of today. A few days ago I pointed you to the video showing the new Select Subject feature. That makes selecting some things WAY easier. That is nice but the surprising part is the apparent improvement in Decontaminate Colors. The Select Subject tool drops you into the Select and Mask… tool, where you find Decontaminate Colors. I use the feature often when clipping out part of an image. (example) I don’t know that it has changed, but it certainly seems to work better. Clipping me out of the green screen in the above image was very quick and easy. May a couple of minutes. Notice the hair along the left side and where it overlaps the right arm. I would usually have to spend some time working on those areas. Not this time. If you have the new Photoshop, check it out. Posted in General Computer Stuff, Photoshop. Tagged Adobe. Posted in General Computer Stuff. Tagged Adobe, Photoshop, Premiere CC. If you are using Adobe’s Premiere, you find that making titles and placing text in you video has changed, drastically. The replacement for Titles is NOT intuitive. It is better but, you need a hint or two to get started. See: Create Titles With The New Type Tool And Essential Graphics Panel In Premiere Pro Cc 2017.1 (Spring) Released 4/19/2017. The tutorial will get you started. I find fancy titles are still easier to make in Photoshop. You can import them as PNG, to preserve transparency. You can also import the PSD file. All the fancy effects (AFAIK) are brought in. The new ‘Essential Graphics’ panel can be docked. Click on the panel name, not the top window bar as in most programs, and drag to where you want it. Posted in General Computer Stuff. Tagged Adobe, Premiere CC. Ever since I updated to Photoshop 2017 I’ve been having trouble finding various tools. Where did Dodge go? And that healing brush? This video explains how to get them back. This has made my use of Photoshop much easier. Posted in General Computer Stuff, Photoshop. Tagged Adobe, Photoshop. We are getting a big update. User interfaces change… :/ I haven’t played with the new apps yet. They are downloading. I expect more videos. There are 8 of Adobe’s apps that are updating. The list in the image below. Within Photoshop is a feature that allows you to search for tools, image layers, help, and stock images. For those of you using Firestorm it is like the search inside Preferences. So, this will be fun. I’m used to looking for effects in Premiere using search. This version has emojis. I don’t know that I’ll ever use them but, they may be fun. They are in the video at about the 25:00 minute mark. They are NOT intuitive. So, watch the video. 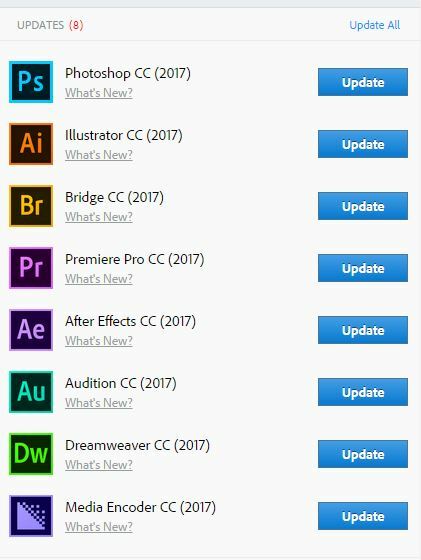 You have options for how you update in your Adobe CC App. Have fun. Posted in General Computer Stuff. Tagged Adobe, Photoshop. Today Adobe released an update of their Creative Suite of graphics tools. I never expected to see a large update like this since the start of creative cloud and subscriptions. But, I was wrong there is a new one out. If you have a product subscription and your Creative Cloud app is not showing the various CC packages with ‘(2014)’ appended, you need to log out of the CC app. The log out is in Preferences_>Account (tab). When you log back in, the new apps will appear. Posted in General Computer Stuff. Tagged Adobe.